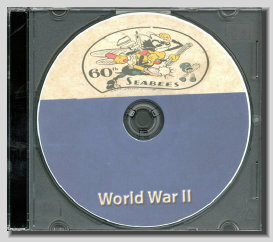 You would be purchasing the Seabees 60th Battalion Album on CD during World War II. Each page has been placed on a CD for years of enjoyable computer viewing. It comes in a plastic protective sleeve with a customized label. 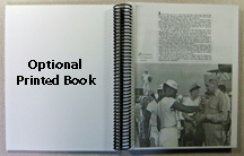 Every page has been enhanced and is readable. Books like this sell for a hundred dollars or more when buying the actual hard copy. That is if you can find one for sale. Construction Sites: <?xml:namespace prefix = "st1" ns = "urn:schemas-microsoft-com:office:smarttags" />Australia, Woodlark and Finschafen. Over 250 Photos on Approximately 124 Pages. 22 Minute Audio "Allied Turncoats Broadcast for the Axis Powers"
22 Minute Audio of an "Equator Crossing" Not this unit but ceremony was the same.